Bluegrass Garden Center & Landscaping Inc.
We carry a wide selection of trees, shrubs, perennials, annual, and superior rated grass seed. 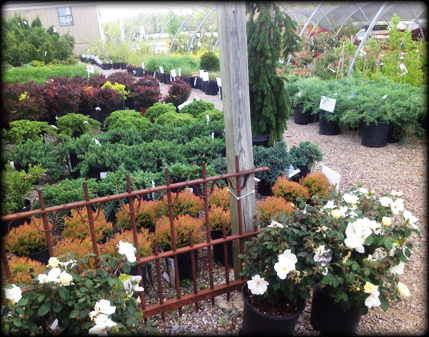 We have great selection of newer varieties of trees, shrubs and flowers as well as the “tried and true” that can form the bones of your personal landscape. We offer Organic and traditional pest solutions, potting soils, fertilizers and amendments, bagged and bulk mulches, compost additives. Decorative items such as fountains, containers, tuned American made wind chimes, trellises and arbors are available for that special touch to the eye and ear. Bird feeders, bird seed, and bird baths are stocked for our feathered friends. Our staff can offer assistance with your landscaping ideas. Remember to bring pictures, measurements, descriptions of amount of sun and shade of the area that you want solutions for. We offer custom potting and containers design services. We use the best soils available along with water saving techniques to help keep your planters thriving. Simply pick from our selection of decorative pots and containers and have us design a lasting work of art for your enjoyment. Delivery services are available for materials you may not be able to handle or haul. Delivery is fee based upon weight, volume, distance and time required to deliver. Finding difficulty finding a gift or memorial for that special person? We offer gift certificates for the hard to buy for person. Bluegrass Gift Certificates are valid for 1 year and can be used for a special plant, garden décor, or anything we offer. Bluegrass Plant Guarantee covers trees and shrubs purchased at regular price for 90 days. Simply bring in dead plant and receipt and we will determine what went wrong and work with you to improve your success with your replacement plant. Our warranty does not cover plant material purchased at a discount or Acts of God including but not limited to drought, wind , hail, flood, freezing , heat or customer neglect.